Esther Edwards Burr (February 13, 1732 in Northampton, Province of Massachusetts Bay - April 7, 1758 in Princeton, Province of New Jersey) was the mother of U.S. Vice President Aaron Burr, Jr. and the wife of Princeton University President Aaron Burr, Sr. whom she married in 1752. Her journal (which she began in October 1754) records her perspectives on her daily activities and current events; it is important in studies of American history and literature. Esther Edwards was the third oldest of eleven children of Sarah Pierrepont and the famed preacher of the Great Awakening, Jonathan Edwards. Esther was named after Edwards' mother and grandmother. She initially grew up in the town of Northampton, but Jonathan Edwards had a falling out with the church in Northampton, which led in 1751 to the family moving to the frontier settlement in Stockbridge in western Massachusetts. Esther Burr was a member of the Church at Stockbridge and Northampton and later the church in Newark. In 1752, Esther married Aaron Burr, Sr., President of the College of New Jersey (now Princeton University). 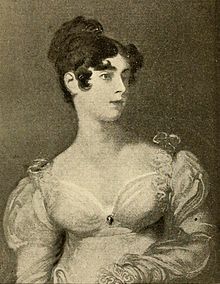 As the wife of a university president and prominent minister, Esther managed the affairs of the household and hosted many of the scholars of the school at her home. Esther Burr's daughter, Sarah, married Tapping Reeve, the founder of America's first law school. Esther Burr's son, Aaron, was the third Vice President of the United States (1801–05). Like the earlier journal of Sarah Kemble Knight, Esther Burr's Journal provides insight into a woman's daily life in the late colonial period of the United States. Esther Burr's Journal might be called an epistolary diary, since, rather than being a traditional diary written as a private record for oneself, Esther Burr's Journal consists of letters exchanged with her childhood friend Sarah Prince in Boston. In the Journal, Sarah Prince is referred to as Fidelia while Sarah refers to Esther as Burrissa. That there exist multiple editions of Esther Burr's Journal can be somewhat confusing. In 1901, the president of Howard University, Jeremiah Rankin, published a book which, despite being entitled Esther Burr's Journal is actually a fictionalized account of Esther's life. It was not until 1984 that Esther Burr's Journal was published in its entirety. Just a month after the death of her father (who had come to Princeton to be Burr's successor as President of the College), Esther died on April 7, 1758 after "a few days illness". The illness turned out to be smallpox, and her death left her two children, Aaron and Sarah Burr, as orphans. Aaron Burr, Sr. had died previously in September 1757. ^ Karlsen, Carol; Crumpacker, Laurie, eds. (1984). The Journal of Esther Edwards Burr, 1754-1757. New Haven: Yale University Press. p. 3. ^ Rankin, Jeremiah (1901). Esther Burr's Journal. Washington: Howard University Print. ^ Dietrich, Rayshelle (December 2008). Everyday Epistles: The Journal-letter Writing of American Women, 1754-1836 (Ph.D.). Texas Christian University. p. 44. ^ Karlsen, Carol; Crumpacker, Laurie, eds. (1984). The Journal of Esther Edwards Burr, 1754-1757. New Haven: Yale University Press. ^ "Princeton, April 12". The New-Hampshire Gazette (83). May 5, 1758. p. 3. ^ Davis, Kenneth (2011). A Nation Rising: Untold Tales from America's Hidden History. Harper Collins. p. 22. ISBN 0061118214. This page was last edited on 21 April 2018, at 03:28 (UTC).